Little more than a century ago, the southern coast of California—bone-dry, harbor-less, isolated by deserts and mountain ranges—seemed destined to remain scrappy farmland. Then, as if overnight, one of the world’s iconic cities emerged. At the heart of Los Angeles’ meteoric rise were three flawed visionaries: William Mulholland, an immigrant ditch-digger turned self-taught engineer, designed the massive aqueduct that would make urban life here possible. D.W. Griffith, who transformed the motion picture from a vaudeville-house novelty into a cornerstone of American culture, gave L.A. its signature industry. And Aimee Semple McPherson, a charismatic evangelist who founded a religion, cemented the city’s identity as a center for spiritual exploration. All were masters of their craft, but also illusionists, of a kind. The images they conjured up—of a blossoming city in the desert, of a factory of celluloid dreamworks, of a community of seekers finding personal salvation under the California sun—were like mirages liable to evaporate on closer inspection. All three would pay a steep price to realize these dreams, in a crescendo of hubris, scandal, and catastrophic failure of design that threatened to topple each of their personal empires. Yet when the dust settled, the mirage that was LA remained. 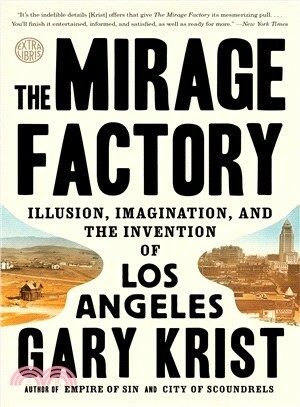 Spanning the years from 1900 to 1930, The Mirage Factory is the enthralling tale of an improbable city and the people who willed it into existence by pushing the limits of human engineering and imagination. GARY KRIST has written for the New York Times, Esquire, Salon, Washington Post Book World, and elsewhere. He is the author of the bestselling Empire of Sin and City of Scoundrels, as well as the acclaimed The White Cascade. He has been the recipient of the Stephen Crane Award, the Sue Kaufman Prize from the American Academy of Arts and Letters, a Lowell Thomas Gold Medal for Travel Journalism, and a fellowship from the National Endowment for the Arts.